***"There is a choice!" An expanded new list of 200 combat officers and soldiers who refuse to serve in the army of occupation. ***"There's a limit!" Support for the new soldiers, and the names of others who have consistently refused to serve, placed by Yesh Gvul. ***"We support the soldiers who refuse to serve the occupation" - a petition placed by civilian supporters. ***"Peres, you are a collaborator in war-crimes!" placed by Gush Shalom. ***"Do not say 'we did not see, we did not know' - the price of keeping the territories" - placed by the Israel Committee Against House Demolitions. ***"A Recipe for National Suicide" - placed by a private citizen. And a huge, blood-red ad, "The Occupation is Killing Us All", signed by the 28 organizations that came together to hold last night's impressive rally in Tel-Aviv (full list below). 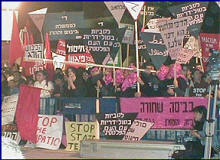 This was the largest pro-peace rally since this Intifada began in September 2000, with an estimated 10,000 participants - Jews and Arabs from all over Israel filling the large Tel-Aviv Museum plaza. The mood is clearly swinging in Israel, and the homemade signs of people who had not attended a demonstration for years reflected the new thinking - "Stop Sharon before he kills us all", "More conscientious objectors! ", "Occupation itself is a war crime", and all permutations of "Share Jerusalem", "Dismantle Settlements", and "Bring our soldiers home". By the time veteran peace activist Yehudit Harel opened the ceremony, the crowd was a mass of people amazed and buoyed by each other's presence, with a great deal of hugging by people glad to be sharing the moment. And then Yehudit's opening words in fluent Hebrew and Arabic set the tone for the entire evening - we Israeli Jews and Arabs together will no longer abide the crimes that the Israeli government is carrying out. "There is only one flag held aloft here today," said Yehudit, "and it is the black flag of pain, mourning, death, bereavement, and the immorality of war crimes that are being committed in our name." At her words, hundreds of black flags were raised high by the crowd, symbolizing the statement made years ago by an Israeli court that if a military order has "a black flag of immorality" hanging over it, the order must be refused. This was a rally in which the young men who refused to serve in the army of occupation were the heroes of the evening, receiving ovation after ovation at every mention. 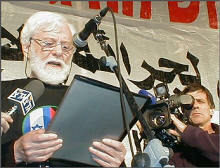 "I once disagreed with refusal to serve in the army," said Uri Avnery to the crowd, "but today I salute those who will not serve. 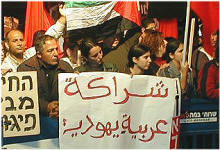 Refusal is the beginning of the end of the occupation." Some of these brave young men have been stripped of their command, demoted, and face court martial, but continue to answer to their conscience. "How can we serve in an army that kills children?" asked Yishai Rosen-Zvi, an Orthodox tank corps sergeant in the reserves, "How can we serve an army that demolishes homes, does not allow the sick to get medical attention, seeks to humiliate an entire population, and reduces them to hunger and poverty?" Between speakers and sometimes during them, the crowd broke into chanting of familiar slogans: "Fuad, Fuad, Minister of Defense, How many kids did you kill today?" 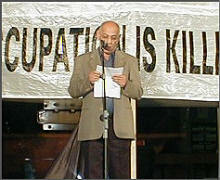 "Occupation, No! Peace, Yes! ", "Money for the poor, not for settlers!" 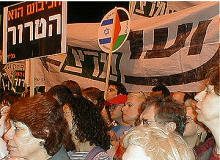 It was a rally in which the stage was shared by Arabs and Jews, women and men, Mizrahim and Ashkenazim, young and old, religious and secular. Distinguished elderly author Sammy Michael pointed out the futility of the ongoing occupation: "Death is not a threat to people who willingly give their lives for a cause." And Shulamit Aloni, former government minister and perennial conscience of Israel, called out her message of hope, "All of you here today are the harbingers of a mass movement that already has begun. You will be the teachers of democracy to this government. You will set an example of morality. We shall clean out the crimes of this country and fill it with peace!" There were many moments that brought tears to my eyes last night. 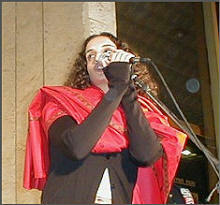 I will tell you of two: Famed singer Ahinoam Nini (known as "Noa", I believe, to her American fans) took the risk of alienating her Israeli right-wing fans, and sang to the crowd a Hebrew, Arabic, and English version of "Imagine" by the Beatles: "You may say I'm a dreamer, but I'm not the only one; I hope someday you'll join us, and the world will be as one." 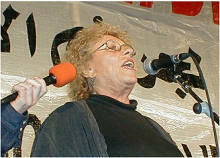 And the other was the transformation of a beloved Zionist song "Ein li eretz aheret". Reciting this song in two languages, Hebrew and Arabic, suddenly infused it with new meaning: "I have no other country to go to. And even if the land is burning under my feet, this is my home." 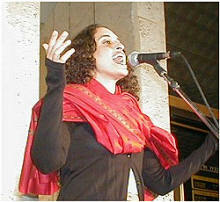 For the Arabs in the crowd, the song suddenly became theirs, too, and for the Jews, it meant a land we both love deeply.